As more and more LCDs, OLEDs and Plasma displays find their way into outdoor applications, the need becomes far greater for them to not only be able to withstand severe temperature extremes (heat and cold) and solar radiation, but the flat panel display must also be readable when exposed to extreme optical conditions such as direct and indirect sunlight, glare and reflection. On an average sunny day, the illumination of ambient daylight is approximately 30,000 nits. Therefore, brightness should be over 900 nits to get a clear image for an outdoor application. Most off-the-shelf LCDs, OLEDs and Plasma displays are not properly equipped to handle all of these requirements. General Digital Optical Bonding Laboratories offers several brightness enhancement solutions to meet/exceed our customer’s requirements. General Digital Optical Bonding Laboratories offers both passive and active backlight modifications to improve sunlight readability. Our most efficient and cost-effective solution is the GenFlective display, a hybrid of transflective and passive enhancements. We also offer a standard transflective display, which incorporates a highly reflective backlight that reflects ambient light back out of the display. Thirdly, we provide the traditional value-add backlight solution, an active enhancement featuring your choice of LED or NVIS backlight technology. A GenFlective-enhanced LCD, OLED or Plasma display is a display that General Digital Optical Bonding Laboratories has altered, using passive enhancements, to improve the brightness (transmissive and/or reflective) and/or the contrast of the display. Although each display has its own personality, due to differences in design, manufacturing techniques and in the stock film stack, we can typically enhance the performance of an OEM panel utilizing Optical Management Films, Polarizers and Diffusers, and a multitude of films and coatings (Contrast Enhancement, Index Matched, Antireflective, etc.). 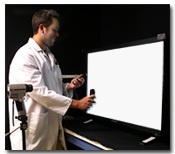 General Digital Optical Bonding Laboratories characterizes your display under dark room conditions and three different simulated daylight conditions. We then do an evaluation of the OEM films in the LCD, OLED or Plasma display and modify this configuration as we deem reasonable. We will do up to four iterations of backlight film modifications and submit the data to you, along with our analysis of what the data tells us. As more of today’s applications require brighter displays, the shortcomings of CCFL backlights become more apparent. In response to this challenge, LED backlighting has been developed to achieve and maintain the required brightness levels of today’s displays. Any size, any panel, any brightness – Below are a few sample configurations equipped with LED backlights to enhance sunlight readability. General Digital Optical Bonding Laboratories is well qualified to enhance your existing LCD, OLED, Plasma or other display type. We can also provide a complete flat panel package, ready to drop in right out of the box.